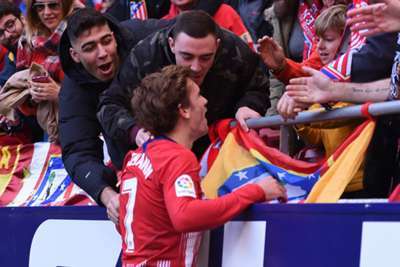 Antoine Griezmann thinks a hectic year for club and country has taken its toll despite a match-winning performance in Atletico Madrid's 3-2 triumph over Real Valladolid. Griezmann laid on Nikola Kalinic's first-half opener before marking his 300th LaLiga appearance by converting a penalty after Kiko Olivas handled his shot on the stroke of half-time. Atletico's usual solidity deserted them and, after Fernando Calero headed home from Michel's corner, Saul Niguez put through his own goal to make it all square in the 63rd minute. It left Griezmann to pounce on a poor clearance from Oscar Plano and seal the points 10 minutes from time but France's World Cup-winning hero was not entirely satisfied with his performance. "I'm glad we won. I'm not quite yet at my best – it's been a long year with many games," he said. "I'm maybe just lacking a bit of speed but I keep going." Griezmann revealed Atleti failed to heed half-time warnings from boss Diego Simeone over Valladolid's aerial threat. "It's usually a strong point of ours, to keep the goals out," he said. "The coach said at half-time that we should stop the crosses from going in. "The fact we scored a third goal really helped us but we have to stop those crosses coming in." There was a lengthy VAR delay before Griezmann emphatically put his penalty into the top-right corner and celebrated with one of his customary jigs. "Football is to enjoy and I decided to celebrate like that," he added. "Obviously they were angered by the VAR but football is joy."